The vast Atlantic Forest, flower fields and plateaus of an endless green divide the landscape with stretches of caatinga. Huge rock walls, canyons, grottos, caves, rivers and waterfalls complete the exquisitely beautiful scenery of Chapada Diamantina. Initially inhabited by the Maracás Indians, the actual occupation occurred during the golden times of mineral prospection, from 1710, when gold was found near Contas River, marking the arrival of the explorers. In 1844, the colonization was boosted by the discovery of valuable diamonds in the surroundings of Mugugê River, and the traders, settlers, Jesuit priests and foreigners that lived in the villages controlled and regulated by the power of wealth. Lençóis, Rio de Contas, Morro do Chapéu and Andaraí are some of the cities where it’s still possible to travel in time and relive the golden period of the region. The architectonical compound dates from Colonial Brazil and preserves an important part of the national history. 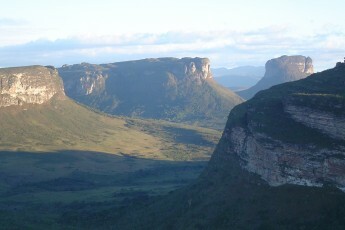 Chapada Diamantina is home to a large diversity of fauna and flora. There are more than 50 kinds of orchids, bromeliads and other native flowers and also rare specimens of animals, such as the great anteater, the giant armadillos, wild cats and innumerous kinds of birds and snakes. The Chapada Diamantina National park, created in the 80’s, is the organ responsible for the protection of all this exuberance. Chapada Diamantina gathers a variety of natural and cultural attractions in the heart of Bahia; the right choice for those looking for peace and quiet or history and adventure.